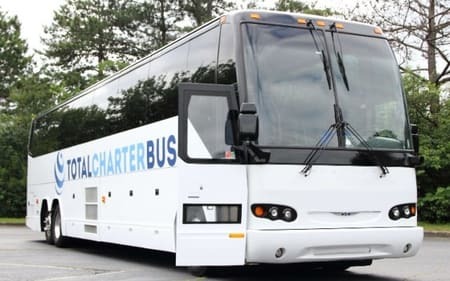 Total Charter Bus Chicago is one of the most-trusted charter bus rental companies in Chicago and the surrounding area. With experience in securing bus rentals for groups both large and small, we’re your #1 choice for simple and organized booking. Call us any time at 312-766-2242 to start planning your trip! Lincoln Park, Riverdale, Englewood, or Chinatown-- wherever you’re headed, rely on Total Charters to find you the perfect bus rental in and around Chicago, Illinois. Whether it’s for a large-scale event, sports team, or private affair, we're guaranteed to find you a charter bus or minibus that fits your needs. Find out how we can help you by calling our 24/7 team at 312-766-2242. Our extensive network includes the newest selection of charter bus & minibus rentals available. Explore one of America’s most popular cities with luxury features such as panoramic windows, reclining seats, ample storage space, WiFi, restrooms, and more. Total Charters puts your satisfaction first, so you’re guaranteed to receive the most exceptional service in the industry. Head into the city from a number of nearby locations, including Detroit, St. Louis, Indianapolis, Louisville, Minneapolis, or Columbus. Groups large and small will love our comfortable bus accommodations paired with top-notch customer service, making for an unforgettable Chicago trip. Whether you're a newcomer or a veteran, we'll make sure you enjoy easy and seamless transportation throughout your trip. Renting a charter bus is also ideal for groups flying into O’Hare International Airport for longer trips. Instead of flagging down a shuttle or renting multiple small cars for your trip, consider utilizing a charter bus during your trip. Your group will have a personal driver available to safely and reliably navigate the Chicago roads. Your special day is more than just a time to celebrate with family and friends. Although the ceremony is exciting and meaningful, planning a wedding can be a long and stressful process. Wedding event transportation doesn’t have to be one of the things on your hot list. Group attendees together to streamline your guests from their hotels to the venue. Coordinate guests through a bus transportation system before arriving at the ceremony or wedding party. A private wedding rental can transport guests with ease while ensuring that your members stay organized and on time to the main event. Streamline your transportation whether planning engagement parties, bachelor and bachelorette parties, bridal showers, or weddings. Each wedding planner will be able to choose which comfortable amenities their wedding shuttles will come outfitted with; including cushioned reclining seats, a PA system, luggage racks, TVs, Wi-Fi, and more. You will also be able to provide safe and trustworthy transportation with certified ADA-accessible buses for elderly guests. Guests will be able to bus to the wedding venue for a simple and consolidated guest transportation solution. Simplify your wedding planning by securing a swift, reliable transportation method in the nick of time! Considering a private shuttle service for your next business event? Book with Total Charters and enjoy streamlined transportation for all of your corporate event attendees. We’ll set up your group with a bus tailored to your needs, whether you need a minibus to shuttle guests between venues or a full-sized coach for long-distance travel. On your bus, passengers can get some extra work done with WiFi, power outlets, and a PA system for impromptu meetings. Prepare for an upcoming presentation or stay current on industry news with ease. Alternatively, your bus can also serve as a place to relax, with reclining seats and air temperature controls available for passenger comfort. Your shuttle service will run on your pre-determined schedule and service your group exclusively for sleek, professional, and reliable travel at your next business event! From your Chicago hotel to any local convention or meeting spaces, we’ve got your travel needs covered. From campus tours at the University of Chicago to elementary field trips at the Chicago History Museum, Total Charters is prepared to give your school group the best travel experience for all of your educational outings. Instead of traveling on an old, unreliable school bus, book with a modern charter bus company for a comfortable trip. We’ll find a bus perfectly tailored to your group, outfitted with WiFi and televisions to keep everyone entertained, even on long journeys. Full-sized models can also come equipped with a restroom to make traveling easy and comfortable for everyone on board. Each bus additionally includes premium and up-to-date safety features to keep even the smallest passengers safe. The buses we charter are perfect for school groups of all sizes, ranging from full-sized charter buses to minibuses across various capacities. Full-sized charter buses are perfect for large groups made up of multiple classes, accommodating up to 56 students and chaperones. Minibuses are best for smaller classes and can accommodate anywhere from 18 passengers to 25 passengers. Enjoy an educational afternoon in the Windy City without having to worry about coordinating school group transportation for all of your students. Known best for their Chicago-style hot dogs and pizza, there’s no shortage of delicious local dishes to try during your stay. We’ll help you build meal breaks into your itinerary for a smooth trip, no matter how many or how few stops you make. Don’t worry about transporting your group to and from different locations around the city. Charter buses can shuttle groups of all types between several locations across Chicago. Enjoy a weekend or even just an afternoon in the Windy City and wrap it up with one of the many delicious eateries in the downtown area. Your group can hit one of the many famous pizza spots like Aurelio’s or Giordano’s. If your group wants to try authentic Chicago-style hot dogs, be sure to visit Portillo’s as well. No matter where your Chicago culinary travels take you, Total Charters is here to provide quality transportation to each eatery. Trying to make it to a cruise or bike tour? We’ll bring you right into the city and drop you off exactly where you need to be, every time. Ensure that your group is able to fully enjoy all of your scheduled outdoor activities with on-time travel, courtesy of your experienced driver from Total Charters. Your group can also enjoy easy travels into the city for river tours along the Chicago River or to visit attractions by the riverfront. A charter bus can shuttle groups of all sizes to visit Lincoln Park and its many activities along the water. Trust Total Charters to match you with the perfect bus so your group can enjoy the many attractions and events Chicago has to offer. We have experience efficiently transporting groups of all sizes for various types of events. The full-sized buses we charter provide an extensive amount of space for guests and any luggage or equipment. Book a private bus to make traveling to your next family reunion, major sports event, corporate event, or wedding efficient and simple. We make it easy to shuttle guests between hotels and event venues such as Barcocina or The Westin Chicago. Once we’ve brought your guests into town, we’ll set up a minibus shuttle service to run between venues according to your schedule’s needs. Instead of relying on a hotel shuttle or public service, you’ll enjoy a personalized service that operates on your time and keeps everything flowing smoothly throughout your event. Want to learn more? Our experienced reservation specialists are available 24/7 to help you! Call us at 312-766-2242 to discuss your trip details or receive answers any questions you may have. With thousands of charter buses available across the nation, we’re sure to find the one that’s perfect for your trip. We can’t wait to help you start planning!